If I understand it right, Fender used some clamps to hold the wood plank when sawing out the body. These clamps left two holes in the body which were filled with wooden dowels. 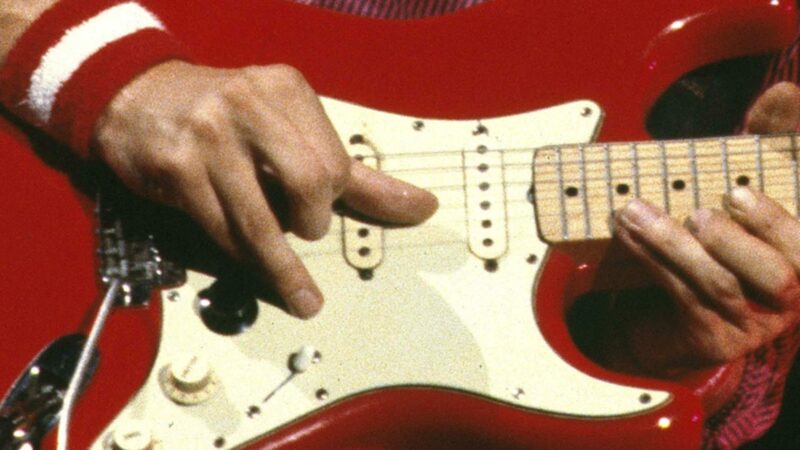 These dowel holes are at exactly the same location on all old Stratocaster bodies – in fact all other models seem to have them as well, however, at completely different places than the Strat. So if you happen to see an old stripped Fender body, you can easily spot these. New Fender and all the reissue bodies don’t have them. Thus this seems to be a reliable detail to tell an old body from a fake. Unfortunately, you normally can’t see them on a painted body, at least not easily. However, if you know exactly where they are and observe carefully the way the body reflects light at these places, you might see them through the finish. This is because old nitro finish is often really thin and the dowel holes leave a tiny inaccuracy in the body surface. And of course there are all those Stevie Ray Vaughn or Rory Gallagher-like looking battered Strats which are partly bare of any finish and allow to see those dowel holes directly. I am not sure in which year these disappappeared, I guess somewhere in the 70ies, when Fender switched to a different method of cutting out the bodies. Ingo. my custom shop ’56 fiesta red strat has these 2 holes too. Really? At the same positions? In this case it seems the Fender CS uses the same tools as Fender did back then. Maybe they even had the original machine somewhere? Would be interesting to know which models have these. I know that Fender stopped using this method, and I doubt that any other manufacturer has them. 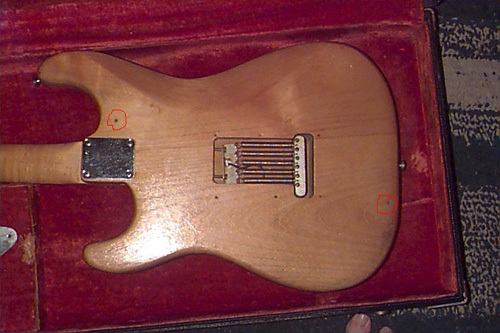 Yes fender CS uses the old method for cut of the bodies all dowel will be found in the same locations But they also stamp CS relic all over the bodies. Why did Fender stop using this method to begin with? Not sure, I guess they switched to a more modern machine. Yes at the same potisions exactly. It is a time machine 1956 strat nos. It says it’s made with the same tools and techniques as the original. Ans I can see the hole on the back and in front of the the body at the opposite side too. Astonishing! Time machine is from the Custom Shop, right? Possibly they really had the original machine somewhere. And right, you can see them on both sides of the body. Yes it’s a Fender custom shop. They say it’s ”built (from original tooling) as if bought new in its respective model year and just found today”. There are dowel holes on the front AND back if the guitar has a factory fitted tremelo. If it was a hardtail/non trem it has the holes on the BACK only. These holes were the clamping holes for the templates used with the overhead pin router. These holes were certainly still there until at least 1974. There will be dowel holes on all fender models because they were all routed on the same type of machine and therefore needed a template screwed onto the body for this process. 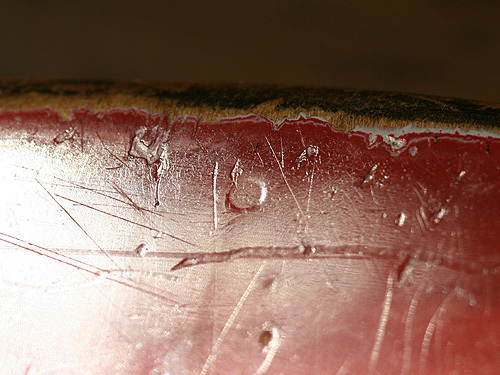 I was checking out my new old ’74 Strat hard-tail…I saw these filled holes on the BACK only. This guitar looks as new as any brand new ones in the retail store in town here…so I was skeptical if it was a newer body with an old neck…yet the neck is mint as well. I just think it was never hardly played at all. I just love my ’74 Strat HT…and to all those CBS haters…go back to bed dreamers…it ain’t the guitar, it’s YOU. Right, the holes are also on the front, I should have stated this more clearly in the article. I did not know however that they were only on the back on non tremolo Strats, so thanks you for the info. And you are right, they disappeared in the 70ies so it is not really a feature exclusively for pre-CBS Strats. The idea was that a ’74 Strat and e.g. a ’64 Strat have different features anyway (kind of wood, contour body shaping, nitro laquer, …) so the dowel holes (together with the right wood and shaping) are a good indicator for an old Fender body. Very cool bit of information! I guess there are a lot of people claiming they have a pre CBS fender out there. Fender Custom shop is not vintage spec at all. WHy people get fooled by this I dont know. The guys int he Customs shop are not very talented. If they were they’d be out on their own instead of pumping out THOUSANDS of gutiars for Fender. How hand made are the 50,000 custom shop guitar each year? Think it over. Take the tuners off your custom shop – they say made in Japan. So is the Trem, strap buttons, neckplate. B HEfner is one of the outsource places for necks. He gets paid about $100 each for them. the guy of the 12 th comment does not have a custom shop…and yes the are made as they used to do in pre cbs time since 1982…beggining with the reessuie models. anchored to the opposite side of the body than the side being routed . Both models needed pick-up routes but only factory tremelo bodies have dowell holes on front. This is because only tremelo bodies needed the rear tremelo route for strings, springs and trem block. The dowel holes on the 1982 vintage reissues (1982 until early 1990s – I don´t know about more recent vintage reissues) are not in the same locations as the original 50s,60s and 70s bodies – another detail is the internal cavities-routs are not identical to pre cbs bodies either – they were replotted and “perfected” for easier production and are therefore slightly bigger and have much smoother and more consistent curves and depths (depths vary greatly from guitar to guitar on fenders from 55-75. It is very easy to see the difference if you put any 60s strat body (for example) next to the reissues (apart from the very few reissues that CS now say they do with orig jigs but as I said they are identified with a permanent stamp into the wood that you could not remove or disguise even if you stripped the paint from the body. It is quite possible the CS have made some bodies using the original overhead pinrouter and original jigs-templates but the bodies are usually stamped with the words reissue or something to distinguish them from originals – although that isnt necesary seeing as the paint that has been used over the last at least 15 years is nothing whatsoever like the paint in the early 1960s. 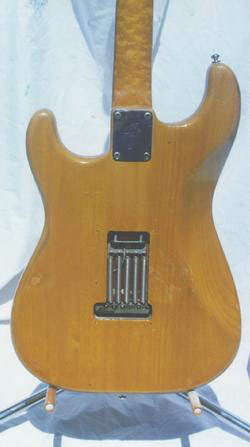 The original templates in the 50s and 60s were not all 100% identical – Fender were probably using anywhere from 5 -20 sets of strat jigs at the same time – even the neck jigs varied which explains why there are 2 distinct headstock shapes which appear from the mid 50s right through to 65 but these 2 shapes are not “year” related – they appear at random. The Custom Shop David Gilmour Stratocasters (both NOS and Relic) have these holes too. Hi guys i have 3 pre cbs guitars and by comparing it with the custom shop guitars there are miles of difference in between both. first of all tuners are reissues and dont really look nothing like the original tuners. the fendar decal in most models its too light definitely not like the originals and sometimes its too dark in comparison with the wood colour where its placed (shameful)!! The knobs are more 70s reissue knobs, on the custom ones the 1 digit its like this (|) while it should be (1)this is definitely a big mistake from the custom shop, regarding the bridge pre cbs has FENDER stamped in one corner and Patent pend printed on the other corner, custom shop has FENDER printed on both corners!!! and they have the nerve to mention these are perfect copies of the fender pre cbs again shameful!!! also these guitars are extremely aged that it doesnt look real mine arent like that it likes likes someone has been banging them against a wall and the paint is so teared out that normally in a real pre cbs it doesn’t go that way……and the prices they dare to ask!!!!!!! shame on you Custom shop!!!! there were many variations on Pre CBS guitars. Assuming that the one you saw that was different from the FCS model is representative of all pre-CBS models is wrong. You should read up on some fender history. they used whatever they could get their hands on. sometimes changes happened mid year and some years there were multiple changes in the same part. some years, they might have the same part made by as many as 4 or 5 different suppliers, sometimes with minor differences. sometimes they would switch suppliers for a few years, and then find some leftovers from previous years and used them up even if they weren’t quite the same. Thanks for the info, I have an old strat that I suspected was genuine pre cbs, it’s pencil dated 55 on the neck. Just checked the body and the dowels are very easy to see through the very thin 2 tone burst finish. There is an example. In this link you can find the post by Hobbyist. slightly inside and away from the edge of the body. It doesn’t look same location as you pointed out.